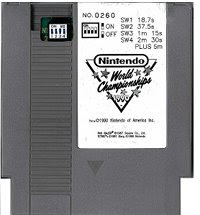 1990 Nintendo World Championships Gray cartridge was a game created for a video game competition Nintendo ran in 1990. The game gives you 6 minutes and 21 seconds to get 50 coins in Super Mario Bros, finish one lap in Rad Racer, and get a high score in Tetris. All three games contribute to a final score, which was used to determine who won the event. The 1990 World Championships were held at 30 different locations nationwide with three different age brackets. The top score in each location and age group went on to the finals. The event was very similar to the movie the Wizard with the national finals held at Universal Studios in California. The winner of each local tournament for each age group received a copy of the gray NWC cartridge. It is believed that only 116 of the gray cartridges were ever made. Gray Nintendo World Championship sells for about $5,000.